MTS is an advanced video format with superior HD-quality MPEG, AVC, H.264 stream video which is utilized by Canon, Sony, and Panasonic just to name a few. MTS format is not acknowledged broadly as MTS is available on Bluray recordings that have the capability of storing a significant amount of data that is not suitable for video editing. Even professional editing software such as iMovie or Final Cut does not acknowledged these file thus prohibiting you from importing them. And this is why you need the best MTS Converter for Mac. The list will guide you on the best converter that is powerful, convenient, affordable and easy to use. 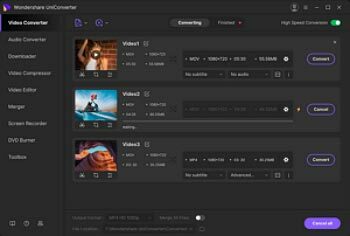 To those who love to edit, download, convert, splice video, this may not be the first time you are going to hear about Wondershare. The way they designed the interface of this video converter is so easy to understand, and it is more than just a video converter. It has a total of 150 video formats. You no longer have to download separate video converter. This is a powerful video converter that can handle any video format. The video format is easy to understand. You do not have to educate yourself about MTS, MP4, AVI, Mpeg, h.264, etc. You just have to find your device and the system has already set the preference for that specific device. Easily download online videos. Copy the URL from YouTube, dailymotion, vimeo and other video hosting site and Wondershare will automatically download it. Conveniently splice, combine and edit video. As it was mentioned above, the software is easy to use. However, since it offers a lot of features, it may take a while before you will be able to get the hang of using it. Aiseesoft has the power to convert an MTS file to popular video formats such as Mov, M4V, DW, SWF, VOB, FLV, WMV, AVI, MKV, 3GP, MPG, and MP4. This software can also support 3d rendering on Mac. It also supports other portable devices such as Apple devices, TV, and mobile phones. For $35, it also comes with a video editing function that supports the basic editing such as crop, merge and watermark. Win X HD is usually a video converter for your desktop; however, it also has a Mac product. It offers its users a convenient way to convert MTS format to different movie format such as QT, MOV, OGM, WMV, FLV, TS, MPEG, AVI, BDAV, HDTV, AVCHD, and MKV. It also supports the most recent firmware and models of Mac and other devices. You can have the full feature of Win X HD for $49.95. The Tipard UniConverter (originally Wondershare Video Converter Ultimate) will cost you $69.00 and will give you access to the wide extension of their video format. The size is around 23.81 MB and supports Mac 10.5 and above. Supports basic video editing such as crop, trim, merge and others. Any Video Converter is the perfect name for this software as it allows you to convert MTS to any type of video. For $49.90, it also gives you the chance to download online videos and rip the DVD content which you cannot find from other software. When you are choosing between paid and free converter; there are a lot of advantages and disadvantages in choosing any of them. With a free video converter, you will be able to save money; however, it is not as powerful as the paid video converter. The video that you can convert on a paid converter for only 4 minutes will take 50 minutes or more on a free converter. Furthermore, do not expect the same level of quality and expect some crashes especially for large files. On the other hand when choosing Paid Converter, you are required to spend some cash but you can be assured that you will maintain the quality of the video. You also have additional functions such as 3D rendering, downloading and editing. Wondershare UniConverter (originally Wondershare Video Converter Ultimate) is the best MTS converter for Mac. It is 30x more powerful compared to the other video converter. It supports all devices even Xbox, chromecast, Apple TV, Roke, and others. It also offers a lot of additional functions such as editing, downloading, burning DVD, seamless transferring of files, video streaming, and others.